Egg, a photo by Adventuress Heart on Flickr. 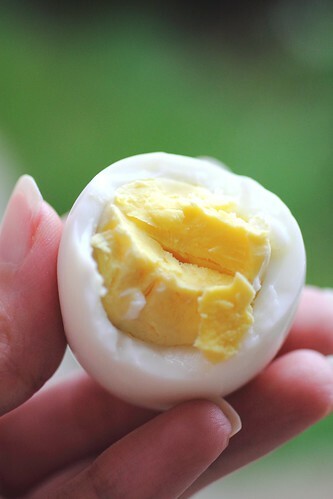 Easiest way to hard boil eggs: Add eggs to pot, cover with water. Sprinkle a pinch of salt in the pot. Place pot on burner, let water come to a boil, immediately cover and remove from heat. Let sit for 10 mins minimum. Peel and enjoy! Beautiful eggs with bright yellow yolks.